This post is a bit late this week, as I've been away visiting friends for the weekend. I've not got much written either, but I've been thinking a lot about the structure of my story, and the way that impacts on character, and then how developments in character unpick the carefully laud out structure. I've written character studies for each main character now, and next step is to develop the story and generate a list of possible scenes. 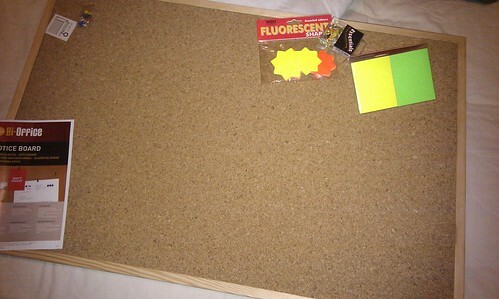 I also bought a planning board! Coloured card and pins too. There's something about stationery shops I've loved since childhood: the smell of new paper, the different coloured pens and specialist pencils. It feels like I'm getting somewhere just buying the equipment, though I want to be careful and put the hard graft in. Nice as it is to have a clear desk, I'm wary of my tendency to say, I can't possibly start writing until I've got something to put my pens in / bought a new notebook / had a biscuit. So I plan to plot each character on the board first, then find where they meet and where they conflict with each other. Hopefully a clearer story will emerge. I've read a few books and online guides on story structure, and some of the exercises are helpful. To be honest, I expected to be able just to start writing, and something akin to genius would emerge. I've had to admit to myself that planning suits me, that I'm not spontaneously gifted but need to think about all eventualities, ponder outcomes and move scenes around like chess pieces until they fit together and create something greater than their sum. It shouldn't surprise me; after all, I'm a project manager by trade. Approaches such as Louise Doughty's or the Snowflake method have helped, and I practise plotting by watching out for character crises, turning points and climaxes in every book I read. I wonder if this practice isn't a little too scientific, though; too formulaic at least. I don't want to standardise the creative process (ugh - it's sentences like that that put me off any creative endeavour in the past). I wonder if the early, great novelists thought about plot points. Something tells me no. Almost certainly not in Dickens' case (his early stuff in particular really benefits from the script editors who adapt it for TV). One of my favourite writers, Henry James, was famous for his near plotless novels, but his stories are nevertheless supple, stretched taut across the minor incidents of people's lives, and rise and shake with emotion and changing perception. I'm not sure that style suits my story, however. I read Ian McEwan's The Child in Time this week, and enjoyed its dreamlike prose and themes of longing and loss, but, unlike other books I've read recently, I thought it was a style I couldn't possibly replicate. Some writers advise not reading while you write a first draft, as what you read could influence your own style unduly. There's no way I couldn't read for a whole year (which is how long I think my first draft will take), but I borrowed Anita and Me by Meera Syal from my friend in a deliberate attempt to change tack and read a different style altogether. I'm keeping a record of what I read with the Now Reading plugin while I write, so we'll see if it has an effect.